Virginian’s Harold Via, Jr.’s Good Night Shirt is all grown up. 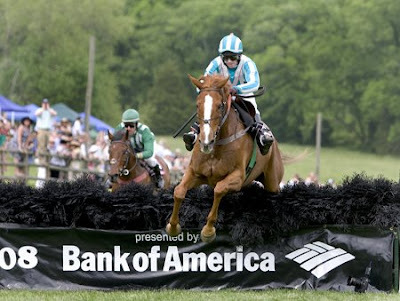 The 2007 Eclipse Award winner as champion steeplechaser put on a clinic to capture his second consecutive Iroquois Steeplechase May 10 at Percy Warner Park in Nashville, Tenn. Going right to the front under regular jockey Willie Dowling, Good Night Shirt set a relaxed pace and turned aside several challenges to win by 4 1/2 lengths over Best Attack with Sweet Shani third in 5:47 3/5 for the 3 miles and 18 jumps. Trained in Maryland by Jack Fisher, the winner improved to 2-for-2 this year and won for the fifth time in his last six starts. He leads all 2008 steeplechasers with $150,000 in earnings. More importantly, he was flawless in a convincing victory. Good Night Shirt opened his 2008 campaign with a Grade I win at Atlanta April 12, but had to overcome a sloppy jump at the last fence to get the win. At Nashville, the 7-year-old gelding set a relaxed pace while getting pressure from Sweet Shani and Bow Strada early. Still in front on the final turn, Good Night Shirt got a brief breather which helped him hold off Best Attack in the stretch. There were no mistakes this time as Good Night Shirt was perfect throughout the marathon Iroquois, thwarting Sweet Shani’s pressing style early and saving plenty for Best Attack in the stretch. Fisher joked that his horse would next take a trip “to Disney World,” but will instead give the Maryland-bred an extended break before preparing for a fall campaign. Major goals will be the $300,000 Breeders’ Cup Grand National in October and the $150,000 Colonial Cup in November. With the victory, Good Night Shirt increased his career steeplechase bankroll to $598,973 (sixth on the career earnings list). He also became the 13th horse to win back-to-back runnings of the race – no one has ever won the Iroquois, run for the 67th time this year, in three consecutive years. – Joe Clancey, S-T Publishing.